Finally, Mizoram government disowned Mizoram Direct Marketing Limited, a company which claimed itself to be a state government’s joint venture with RMP Infotec. A strict disciplinary action would be taken against the senior IPS officer, who is said be behind all this. 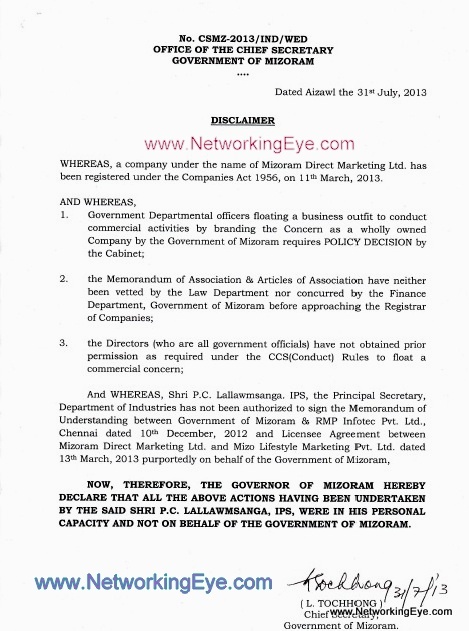 A disclaimer issued by the chief secretary’s office said Mizoram Direct Marketing Limited, signed up under the Companies Act 1956 on March 11, 2013 was launched by Principal Secretary of the state Industries division P C Lallawmsanga in his personal capacity, and not on behalf of the government of Mizoram. The disclaimer said” If government officials float any business then they require Mizoram government’s policy decision taken by the Cabinet, where as in Mizoram Direct Marketing Limited no such prior approval was taken. Lallawmsanga, Principal Secretary of the state Industries has not been authorized to sign the MoU between the state government and Chennai-based RMP Infotec Pvt Ltd. Chief Secretary, L Tochhong on Thursday told media persons that the government was contemplating taking disciplinary action against Lallawmsanga, a 1984 batch Tamil Nadu cadre IPS officer holding the rank of Additional DG of Police. Punitive action will be taken against 2 more directors – Teresy Vanlalhruaii and Lalbiakthanga Chhakchhuak, sources stated. Mizoram Chief Secretary informed Lallawmsanga not to attend the Kolkata launching function, but latter disobeyed her orders claiming that he has blessing of the state chief minister. It is also suspected that some other government officials in the state Information and Communication Technology department and National Informatics Centre (NIC) were involved as the website was also reportedly designed by the state government-owned Zoram Electronics Development Corporation Ltd. (ZENICS). 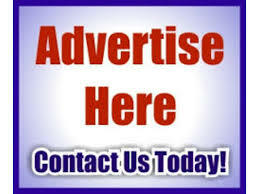 In the recent update: Lallawmsanga, Industries secretary suspended.